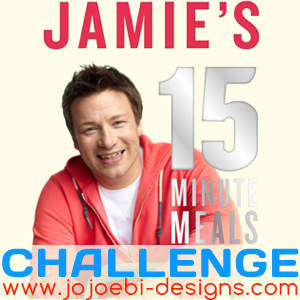 jojoebi designs: Are you up for a challenge? One of my Christmas presents was Jamie Oliver's new book, 15 minute meals. Since living in Japan, I have become very skeptical about cook books written in English basically because it is usually a nightmare trying to source the ingredients. I have, over the years I become an expert at bodging recipes together, using what I can get. There is a pantry list supplied with the book and you can download the PDF version here, I don't have everything on the list but what I have done is to go through the recipes I will be trying out first and stocked up with anything I needed, what I haven't been able to get in the supermarket, I have been able to order online (three cheers for the internet!). Anyone IN Japan, there is a great facebook group, Japan Friendly Recipes - When you go to sign up, please leave a message to the group owner telling where abouts in Japan you live. (The group is for Japan residents only). The recipes in the book are all healthy and there is a nutritional breakdown for each meal at the back of the book. We are trying to move away from eating processed foods or at least in moderation, choosing freshly prepared if possible. I am also all for getting in the kitchen and getting out again quick, I do enjoy cooking but not all the time, some days I just want the food on the table already, so the idea of doing it in 15 minutes really appeals. Now, I know there is a lot of skepticism about actually putting a fab meal together in 15 meals and when you look at the pictures you think, no way! So, I thought it would be fun to do a challenge, want to play along? On a Thursday I will do a blog post reviewing one of the meals from the book. Whether I managed to meet the 15 minute challenge or not. If not, where I thought I had gone wrong or how I think I can do better next time. I'll also add any Japan cheats for those of you in Japan and facing the same issues. Now, I don't eat fish and I don't cook it so there will be no fishy recipe reviews! If you want to join in and you blog, grab the badge, link to the new weeks post and write up your review on your blog then add the link in the comments. If you don't blog or you do but this doesn't fit with your bloggy theme then just leave a comment with your chosen recipe, review and feedback. The first recipe I am going to try is Chicken Dim Sum on page 24, you can either do the same one or pick something completely different. If you don't have the 15 minute meals book but you do have the 30 minute meals, then use that.